Plastics are safe, reliable, light, and cheap: these characteristics lead to a growing use in the construction industry. Furthermore, plastics are increasingly the first choice regarding the thermal insulation of buildings. 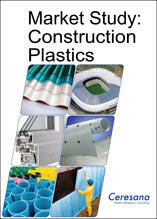 The market research company Ceresana analyzed the market for plastics that are used in the construction industry. The different types of plastics are examined individually, especially PVC, HDPE, PUR, EPS, PP, PS, LDPE, LLDPE, PC, ABS, and PA. Demand for plastics for different products, such as pipes, insulation materials, and windows, is also analyzed, as well as the development in the construction segments new construction and renovation plus residential construction and non-residential construction. The analysts of Ceresana expect global demand for plastics in the construction industry to increase to a level of 73 million tonnes in 2023. Demand for more energy efficient buildings increases worldwide. In the developed industrial nations in Europe, North America, and Asia, the focus is mainly on the energy efficient renovation of existing building structures; the new construction of buildings accounts for a comparatively slow dynamics. The situation is rather different in the emerging nations where tendencies are towards high activity in new constructions. A growing population in combination with a progressive urbanization leads to further increases in demand for new apartments. Besides Asia and the Middle East, Africa will also be a hot spot for urbanization in the near future. Additionally, the average size of households is decreasing worldwide which causes an increase in average per capita living space. At present, the construction industry in some emerging countries like Brazil or India is affected negatively by corruption scandals, dissolution of the government, lack of regulations, or insecure investment conditions. However, an enormous future potential for example for plastic windows exists also in these countries since their market shares have been small until now and the advantages are becoming more and more evident. Not only industrial countries but also more and more emerging markets declared the reduction of greenhouse gas as political aim. Energy saving is a main starting point hereby. Since a major part of total energy consumption is registered by heating and cooling of living areas and commercial buildings, it becomes more and more important to install suitable systems to increase energy efficiency. The International Energy Agency (IEA) assumes that to fulfill all aims of the climate conference of Paris (December 2015) until 2030, investments in the segments energy efficiency and climate-friendly technologies amounting to USD 13.5 trillion have to be made. Increasing numbers of support programs and legal regulations are passed worldwide which target the increase of energy efficiency of buildings. These programs have a high impact on the dynamics of the respective insulation material markets. However, extent and consequences of the implementation of these programs can be very different from country to country. Thus, this study examines these aspects separately in each country profile. Besides the construction segments new construction and renovation, this study also analyzes demand for plastics in regard to residential construction and non-residential construction. At a global level, residential construction is currently an important driving force for the demand for plastics. The ongoing trend of urbanization in large parts of the world is a decisive factor in this. Creating affordable living space in the cities is one of the most urgent aspects of many national development plans. However, the distribution among the construction segments in the regions and countries can vary considerably. Therefore, this distribution is given separately in each country profile for the specific country. Worldwide, especially the plastics PUR and EPS as well as the engineering plastic polycarbonate account for high growth rates in the construction industry. Growth rates of the two first-mentioned plastics are caused by the dynamic development in the segment insulation materials. Polycarbonate is mainly used for transparent sheets in the construction industry which become more and more popular for designs with a high light incidence. However, other plastics such as PP and HDPE also increasingly replace traditional materials in the construction industry. Chapter 1 provides a presentation of the global market for plastics in the construction industry – including forecasts up to 2023. Data on demand and revenues are analyzed for the six regions Western Europe, Eastern Europe, North America, South America, Asia-Pacific, and the Middle East and Africa. Chapter 2 provides market data for the 16 most important countries, that is, country-specific information on demand (in tonnes) and revenues (in billion USD and billion EUR). Additionally, demand is given in detail for the different types of plastics, products, and the construction segments "new construction" and "renovation" as well as "residential construction" and "non-residential construction". Chapter 3 presents the demand split by the several types of plastics. Market development of the plastics PVC, HDPE, PUR, EPS, PP, PS, LDPE, LLDPE, PC, ABS, PA, and other plastics is examined. Market data is given in tonnes. Chapter 4 takes a look at the demand for the particular products. At a country level, demand for plastics for the products "pipes", "insulation materials", "windows", and "other products" is presented. Chapter 5 provides profiles of the largest manufacturers of automotive plastics – clearly arranged according to contact details, turnover, profit, product range, production sites, and profile summary. Extensive profiles of 97 manufacturers are given, including BASF SE, Borealis AG, Braskem S.A., Dalian Shide Group, Exxon Mobil Corporation, Ineos Group Ltd., LG Chem Ltd., Mitsubishi Chemical Corporation, Mitsui & Co., Ltd., Saudi Basic Industries Corp. (SABIC), Total S.A., and Versalis S.p.A.